To make the gnocchi steam your potatoes and peels over boiling water, covered, for 15 minutes. Move them to a large bowl and mash. After they cool slightly, gently mix in your eggs, half-and-half, bacon, cheese, chives and salt. If you are of the veggie persuasion or just don’t like bacon (is that even possible?) you can always omit it here and sprinkle some hickory smoked salt on before serving. Add flour, one cup at a time, mixing after each addition. A lot of this is tough to gauge so if the dough seems too sticky, it probably is. Add more flour. Flour a surface, roll each piece into a one-inch rope. 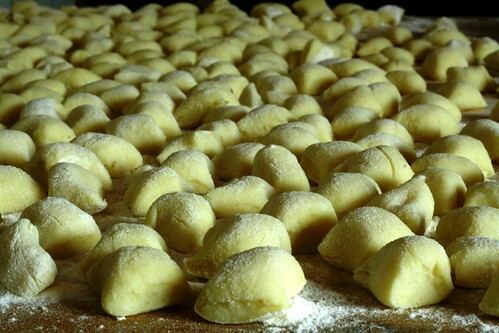 Flatten the dough slightly with the gentle pressure from a fork and cut into 18-24 individual pieces of gnocchi. Transfer gnocchi to sheet pan lined with parchment paper and cover with a towel. Toss them in a fridge until you’re ready to cook. For all types of gnocchi I bring a pot of salted water to a rolling boil and add the gnocchi, cooking for 1 minute or two. If I want to freeze any for future use, I take them out at this time to cool and package later. Otherwise, I let them cook for another 2-3 min until they’re tender.